What is “home” to you? Is it the house you’re living in now? Is it the house, city, state, or nation you were born and/or raised in? Is it where your family is? Is it wherever God takes you for His purposes? Home can be any of these, or all of these. “Home” for me as I grew up was a beautiful white, nearly-century-old home in the deep south. I lived there most of my life before I married and moved out in my late teens, and then again briefly in my early 20’s. My father, Leland S. Moore, Jr., researched the house and he found that its earliest deed was 5-4-1915. 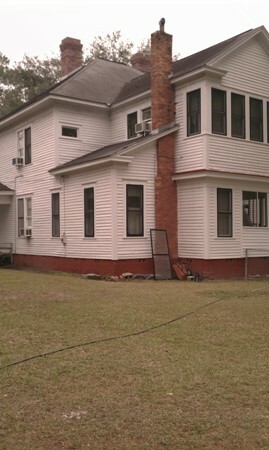 The house and 2/3 of the property it lies on was deeded to my (now deceased) maternal grandmother Louise W. Gentry, my maternal aunt Mary, and my (now deceased) mother Margaret Holmes Moore in 1959, then later to my father. The house is also the location of my father’s CPA business, which he still runs! (He is 75 years old and says he is now thinking about retiring!) My mother worked as his receptionist and bookkeeper. While growing up, we kids were chastened by our mother coming out of the office, “Shhh! Be QUIET! There’s a client in the office!” Clients throughout the years often heard us kids tearing through the house, yelling, laughing, and playing…it’s a wonder my father could keep any clients! There was also the time my little brother, a toddler at the time who was supposed to be taking a nap, woke up and managed to not only climb out of his crib, but unlatched the screen at the bedroom window and started walking around on the roof….a client had an appointment, saw my brother up there and said, “Stay there, son!”, and hurried inside to tell my dad. My father ran up the stairs three at a time to retrieve my brother off the roof. Thank God he was okay and a tragedy avoided! But other than us kids being too loud at times and my brother’s roof exploration, having a place for both business and home has worked for my dad all these years. Maybe that is where I get it from. 🙂 Looking back, I now realize that those seeds of entrepreneurship were planted in me in childhood. I remember my father working 10 hour (or longer) days while I was growing up. He enjoyed his work ~ and still does today (although he told me he only works “part-time” now – he only works from 9 or 10 a.m. until 5 p.m. now!). The office was “fun.” My siblings and I used to play “office” at night, while our dad would go to the store. We would “answer” the phones, type on mama’s typewriter, make Xerox copies, “order supplies,” etc. When daddy came home, we’d run out of the office. Then Mama would boil and salt the peanuts that our dad had brought home, and we’d all sit down together in the den, watching Hee Haw on t.v. (yes, really!) or the Flip Wilson show. My dad would eat bowlfuls of peanuts, and laugh at Flip Wilson. I have never seen another house quite like the home I grew up in. It is two stories, with a wrap-around. 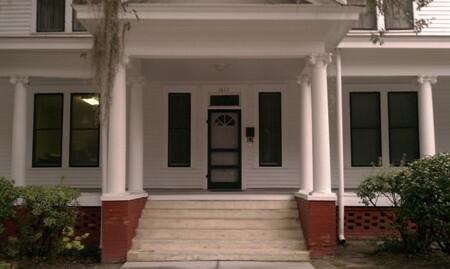 gray front porch (sometimes called a verranda) that surrounds the house, with a series of tall, white columns. Columns not only hold up a house structurally, but they are also design elements of classic architecture. These Greek column designs are used on buildings all over the world. 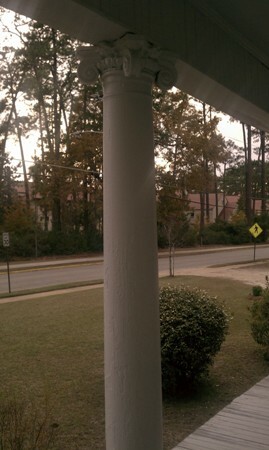 From what I can tell, the columns at my father’s house are Doric design columns. The house is spacious inside (approximately 4,374 square feet) with tall ceilings. It has 11 rooms, not counting a back, screened-in porch, two halls, and 2 bathrooms. 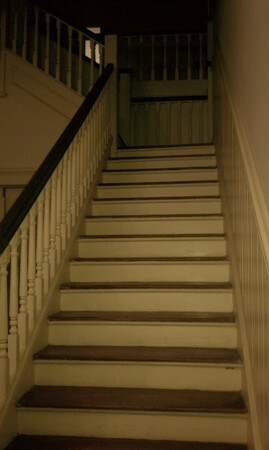 It has two staircases inside, a back one which may have been used for the servants. In one of the rooms which my father uses for part of his office, there is a doorbell by a door which still rings. (My brothers, sister, and I used to love ringing it, much to our parents’ annoyance!) Originally, the bell was made for and used to beckon the butler or the cook. 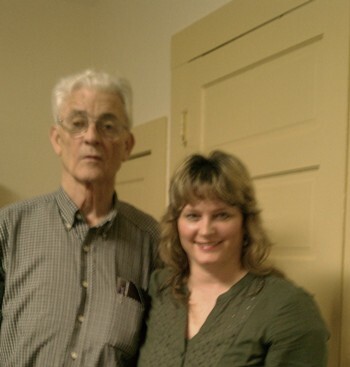 When I talked to my father on my trip to Valdosta, he told me about a conversation he’d had with someone, who shared an amusing story about the previous owners. The story goes that the small closet in that room with the bell was used at times to store (and lock up) bunches of bananas, because the owner loved bananas and didn’t want anyone eating them. Since bananas are my favorite fruit, I thought that was interesting and funny. 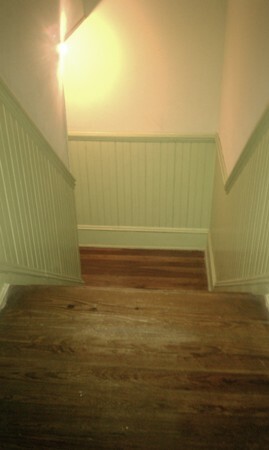 These are the beautiful front stairs inside the front entry hallway. My brothers Greg and Herbert, my sister Maria, and I used to slide down the bannister, even though our parents told us over and over NOT to do this, because we could fall off and get hurt – but it was so much fun! The house is still in good shape overall, with some of its original beauty and character preserved. My father had the ceilings lowered when he and my mother Margaret moved into and renovated it in the early 1960’s, to better heat and cool it. My dad, smiling at the memory, said my mom refused to live in it unless he renovated it. It was in bad shape from previous careless tenants. One of the renovations was a new roof, which back then cost only about $1,000! You can see in this picture of the back of the house how there are various levels of roofs, as well as the many, large windows. 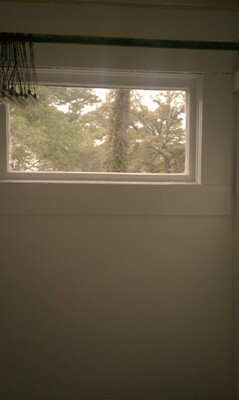 A unique window in the house is inside the closet of my youngest brother Herbert’s old bedroom. It’s small, rectangular and quaint. Things like this are often what make old houses have such character, like the front hallway’s antique chandelier, the French doors in the living room (what used to be called the “front parlor”), and pretty doorknobs on the doors. The house still has its original fireplaces and mantels, which are beautiful and elegant. 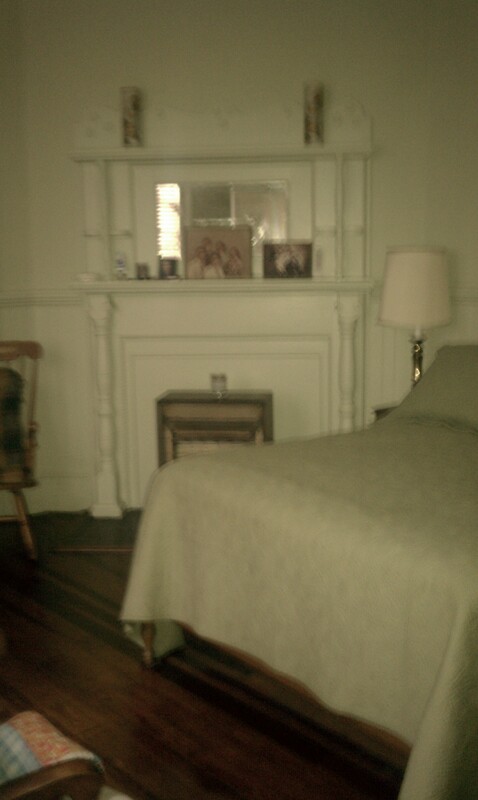 But they closed up the fireplaces to avoid a fire and put in gas heaters to warm the rooms, like this one below. 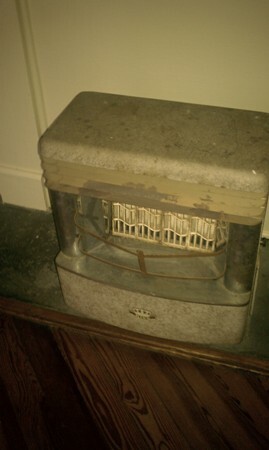 Even with the heaters, the house was like an ice palace in winter. My brothers, my sister and I hated getting up in the dark, out from underneath our comfortable blankets, having to face the cold to get ready for school. We would try to warm up by the heaters as long as possible, wanting to avoid taking a shower ~ the hot water often ran out quickly! Since then, my dad has had more insulation put in the house, so it stays warmer and cooler easier. His office also has a window air conditioning unit, a MUST in sticky, humid, southern summers! During heat waves, the temperatures swell sometimes to over 100 degrees in summer in Georgia. 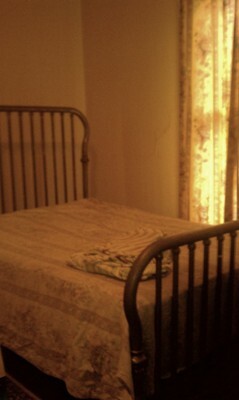 Below is a picture of my father’s bedroom that is now downstairs. This room used to be the family dining room, where we celebrated big Thanksgiving and Christmas dinners. You can see another one of the lovely, original fireplaces and mantels. One of the most incredible features of this house are the floors. 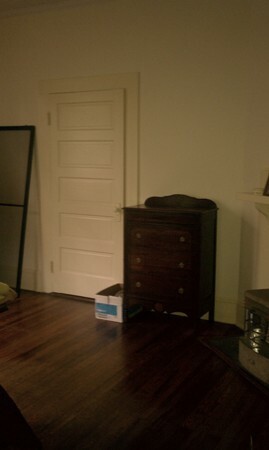 The house still has the original, hardwood pine floors. They just don’t make beautiful floors like this anymore! 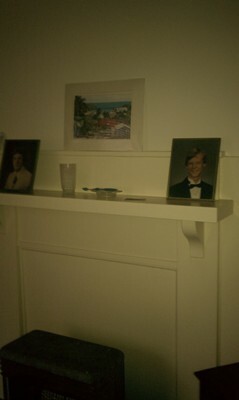 On the mantel of my old bedroom were some pictures of me and our oldest daughter Heather. It’s funny; when Heather showed this picture to her oldest daughter Annabelle (age 8), she immediately recognized that it was “Nana and mommy!” (me and Heather) Check out my 80’s curly perm, lol! 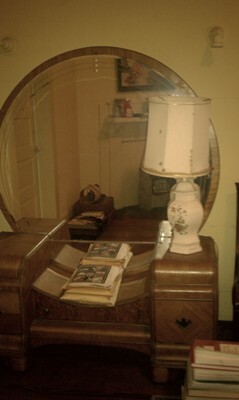 Here is where my “writing career” started – this antique, round-mirrored dresser that was mine as I was growing up. I would sit in the curved part of the dresser and write in my diary or write short stories, then stuff them in one of the drawers. This “writing desk” is where it all began! Where was your original writing room or writing desk? The house is still incredible – one of a kind – and what I’ll always know as “home” in Georgia. 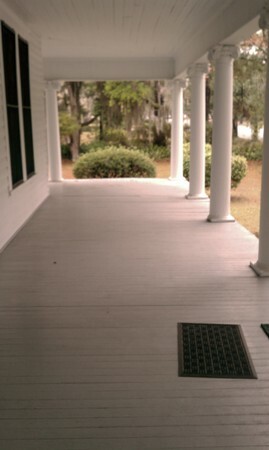 They don’t build solid, beautiful, southern homes like this anymore. 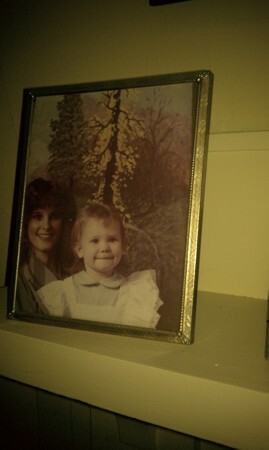 Outside in the back yard, my father showed me a tall, sturdy pine tree that he had planted there just before I was born. 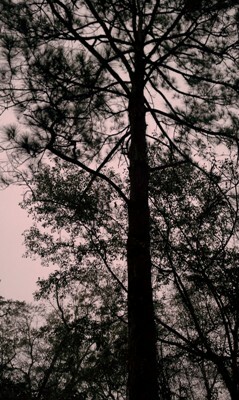 As I looked up into the sky at the magnificent tree, I was amazed. God spoke to my heart through it, which I will share with you later this week. Where – or what – do you call your home? ***Stay tuned when I write about my dream home tomorrow.